In addition, the report notes that philanthropies, governors, and state legislatures increasingly recognize the importance of investing in children. Nonetheless, the report says, achievement gaps have widened. There aren’t enough seamless transitions from pre-K to grade school. Too many low income children aren’t getting the support they need. And Congress isn’t providing stable funding. To address these issues: “All policies should stem from the overarching goal of improving the interactions between teachers and children, which research identifies as critically important to children’s future success in school and in life,” Laura Bornfreund, deputy director of New America’s Early Education Initiative and lead author of the report, said in a news release. “Without taking these actions… we are never going to be able to accelerate access to quality education, birth through third grade,” Guernsey said. To follow Twitter coverage of “Beyond Subprime Learning,” including a tweet chat at 3 p.m. today, use the hashtag #beyondsubprime. “We want America’s children to become life-long learners who are able to think critically and inventively, regulate their emotions and impulses, and make smart decisions by drawing upon a rich knowledge base about how the world works. 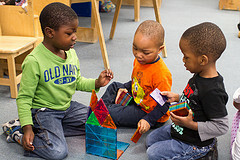 Realizing this goal begins with ensuring a seamless continuum of high-quality, easily accessible early education for all families,” the report says. “Too often, key findings on how children learn are never applied in practice,” the report says. And research findings end up in expensive journals, far from parents and educators. Instead, publically financed research should be readily available to the public. And, just as implementation science does, research results should include insights about how to put findings into daily practice.